Home > Blogger Network > Spring Is Here! Hi Minerva crafters, spring is already here and as it is one of my favorite seasons I am enjoying it so much and have been into the mood of sewing lighter and more season appropriate garments. 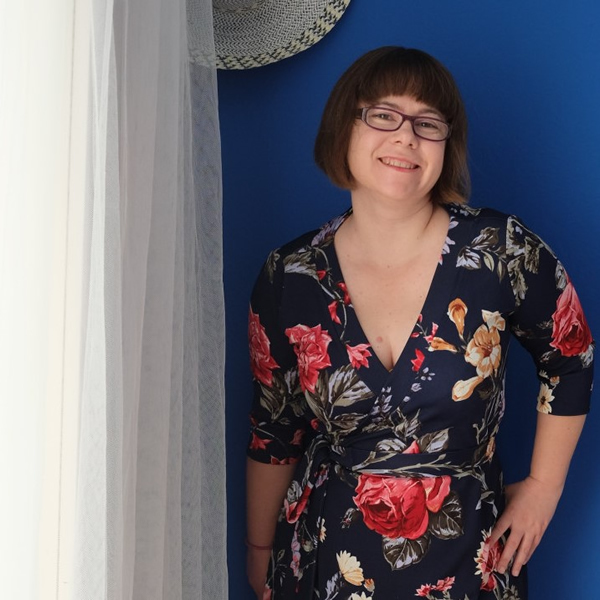 Continuing my goal to add more tops in my wardrobe for this month's post I have made one more blouse but I'm afraid I got too optimistic and the version I made is rather more summer than spring appropriate. The pattern I chose is from the latest collections of Simplicity Patterns, it's nr. 8693 and as described in the pattern it is a classic Misses' shirt with a feminine update, an off-the-shoulder neckline, including a shoulder strap with sleeve and neckline variations. The fabric I chose is a gorgeous Sandwashed Cupro Fabric from Lady Mc Elroy in the pink colorway, this fabric feels so fresh, soft and fluid that you barely feel wearing it, I really love everything about it and am happy I picked it. That being said, cutting it was not so easy, at least not for me. In general, I'm not used in sewing with delicate and fluid fabrics like this so I did not do a very good job cutting the pattern pieces, especially the collar that was cut off the grain, you get to cut the specific pattern 4 times and none of these 4 pieces were cut the same. Afterwards I figured out a couple of things I could have done differently to do a neater job, like block fusing the interfacing and also laying a piece of cotton fabric under the cupro so that it would not move around as I was cutting it would have been a great idea but I actually did none of these. I usually am quite systematic in the way I work, when I start a new project I like to plan my steps before starting but this time it just was not like that. On the other hand, I didn't have a problem sewing it at all and I found it was easy to handle. The pattern has 4 different views and I made view B with some alterations. At first I decided that I would like to omit the shoulder ties, I thought I will try it without the ties first and if it didn't stand nicely and the ties were needed to keep everything in place I would add them afterward, fortunately, the blouse sits pretty well on its own so I omitted the ties. The second alteration I made was to shorten it by 15 cm and add an elastic band in the hem to mimic the sleeves. I am happy with the alterations I made and love the overall look of this blouse. Usually, it would bother me a lot to see the wonky collar but with this one, maybe because the fabric is so beautiful and also because the design is so special and unusual I completely oversee the mistakes and look forward to wearing it over my skirts and high waisted trousers.